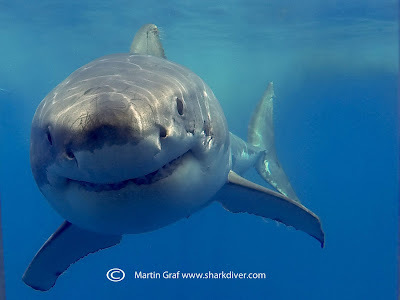 Shark Diver : Shark Diving : Swimming With Sharks: What's it like to come face to face with a Great White Shark? 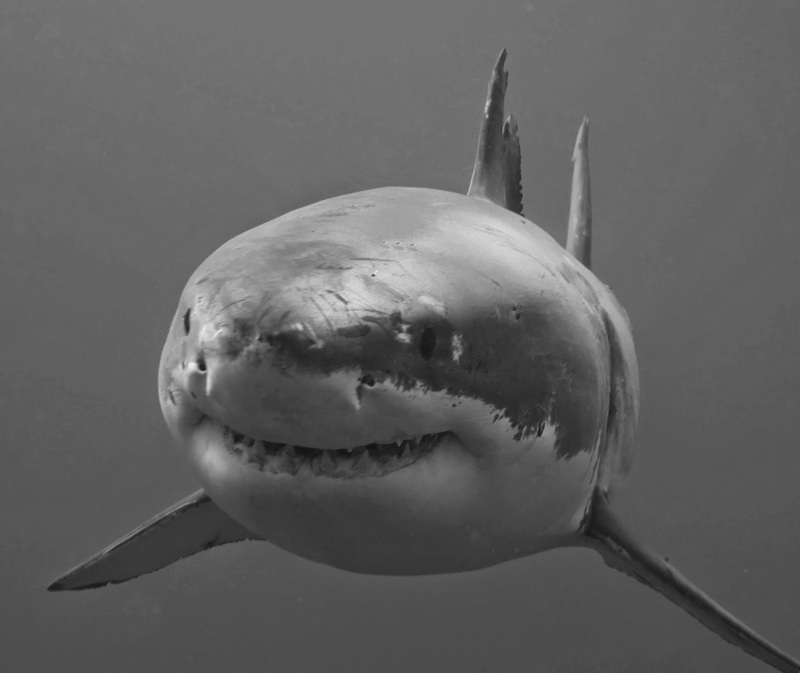 What's it like to come face to face with a Great White Shark? What's it like to come face to face with a Great White Shark? That is a question I get asked time and time again. With the news media portraying sharks as blood thirsty, mindless killers, just looking to eat us, most people think I have a death wish, diving with sharks. So I thought I should share what it is really like to come face to face with one of the most feared creatures on earth. Here is a little video that shows how most people think an encounter with a shark will be like. The reality it is more like the sharks swim by slowly, looking you straight into the eyes and showing absolutely no signs that they want to eat you. When I first started diving with white sharks, what struck me is the fact that it is not scary at all. I'm by no means the only one that feels that way. 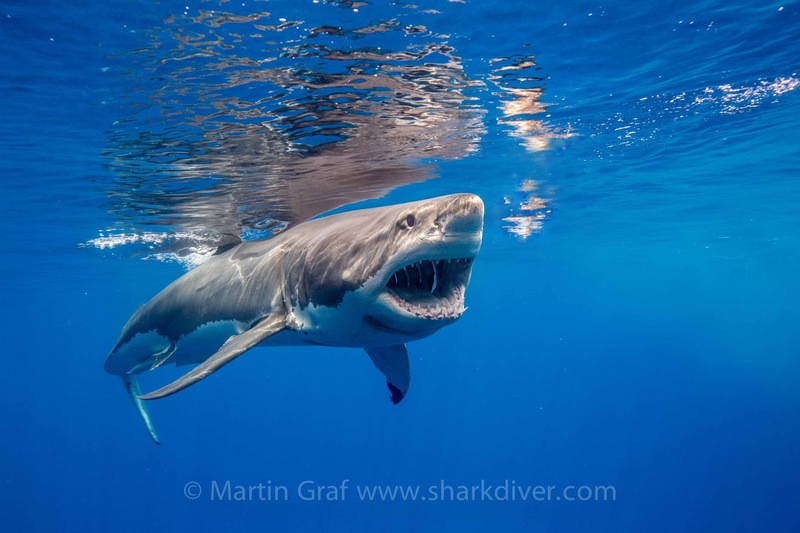 In 15 seasons of taking divers to meet these awesome creatures, the most common reaction when coming face to face with a great white shark is just awe. Even divers who saw "Jaws" and joined us expecting a huge adrenaline rush, mostly are just blown away by the experience and don't find it the least bit scary. The scariest part of the expedition is the anticipation of that first meeting. I remember that after about 3 trips to Guadalupe Island I started thinking "I've seen it" and didn't expect to do this for much longer. Well, at the time I didn't expect to be in the cage and have "Shredder" swim by to check me out. When he looked me straight into the eye, something happened. I realized that this huge shark is focused on me, that he was individually checking everyone out. Thinking back, that is when I fell in love with those sharks. Now as I always say to our divers. I love those sharks, but it is not a mutual feeling. That is perfectly OK. I love them for what they are, awesome predators, not mindless killers, but certainly no harmless pets either. I don't feel the need to tell everyone that these sharks love me and that I can go hold onto their fins, because they accept me as one of their own. Come to think of it, I'm glad that they don't treat me as one of their own. Even though I'm not a small person, in terms of white shark size, I would be a very, very small shark. White sharks definitely are into having their personal space and don't react kindly to a smaller individual invading that space. I've seen what they do to a smaller shark that is doing this. I've been diving with sharks for over 15 years and I'm excited every time I'm about to get into the water with them. I find them fascinating and discovered that they are generally very cautious and even shy, not the mindless killers the media makes them out to be at all. Last season I saw 3 white sharks that got scared by a towel that fell overboard and drifted down. 2 of them checked it out and got the heck out of there. One of them kept circling it, approaching it and jerking away, when the towel moved a little. He kept doing that until both he and the towel went out of sight. 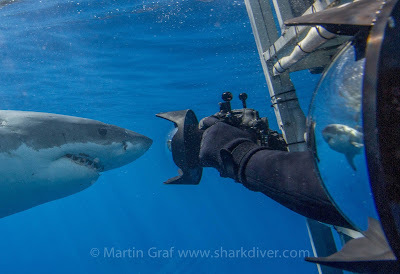 I hope that I have given you an idea of what it feels like to come face to face with a great white shark. If you really want to know, there is no substitute for experiencing it for yourself and I hope you'll get that chance. It is an experience you'll never forget. When you do go out, remember that while we don't have to fear these sharks, we definitely have to respect them. 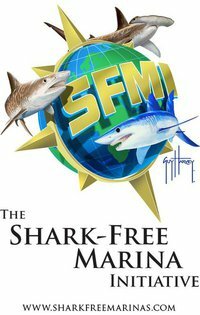 We at Shark Diver promote "Safe and Sane Shark Diving" that respects the sharks and the environment. 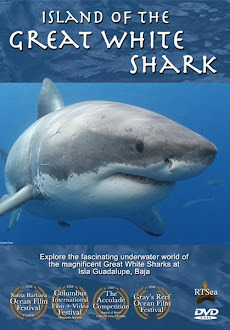 We hope to see you on one of our expeditions to Guadalupe Island.